We went to Discovery World yesterday. Well, we started off by going to the Milwaukee Public Museum but after getting in a queue and then being told it would be a 45 minute wait just to get a ticket, we decided to give it a miss and do Discovery World. Discovery World is right on Lake Michigan. I took these pictures of the lake while we were there. Those waves are not waves. It is difficult to see in the photos but it is frozen. It is quite amazing to see. Anyway, we had a fab time at Discovery World (aquariums, nautical stuff, sciences......physics, bio chemistry stuff............engineering stuff........ mechanical stuff..........audio stuff........media......all very kid friendly (me friendly too as most of this is beyond me). I did feel pants though. I seem to have the Christmas cold that my chums across the pond have all enjoyed. Mine is not the flu. Apart from the fact that I had a flu jab.....I do know the difference between a cold and the flu. Flu is nothing like having a cold. I have a cold. I haven't had a cold in years which is probably why I feel so crap. I have been putting on a brave front and pretending I am alright but that is what you do when you have family staying and you want them to have a good time. It is now New Year's Eve. We are 6 hours behind jolly old England so it is only around 8.30pm for us right now. I will not be seeing in the New Year. It can see itself in. As I have said before, I don't say "Happy New Year" to anyone. New years are something I view with trepidation. I do wish everyone a healthy new year and hope they wish me the same. In some ways it was brill. Donna and Lauren visited us here lots. We love having visitors...especially them. I had a longer than usual stay in England but it wasn't all enjoyable as Glenn was dangerously ill at one point. I spent the majority of my stay sitting by his hospital bed.....or so it seemed. I did enjoy eventually catching up with some old friends in Ashford. I consider them true friends as it doesn't seem to matter how long it has been since we met.....we just carry on from where we left off. Met a new friend in Folkestone........and a couple of new furry friends there too. We had a lovely evening with them. Big big Steve is still a sweetie and his ladyfriend is an amazing lady. I wish I could have seen more of them all but the hospital business sort of limited me. I met up with several old chums from my Christchurch days. They also don't change. We shared a lot of memories....good times and bad, but I think we shall always be friends. My good friend Heather (she took me in when I was homeless :) ), was back from teaching in Dubai. It was great to see her. We went to Dover Castle but most of it was closed. She said she hadn't realised how much she missed me until we were together again. Oh what a kind thing to say. She asked me to go to Goa with her in January and February (she has a house there). But, that is Alanmas !!!! I can't miss Alanmas. I met some other new friends too. I was fortunate enough to be invited to Philip's father's wedding. I almost didn't go because Glenn was in the hospital. Actually he was supposed to go too. I really wanted to go and at the last minute I decided I would. I met up with Alan there. This was fab too. I usually only ever see Alan in the thick of Milwaukee winter so seeing him on a mild Autumn day in Canterbury seemed odd. I had met their father a week or so before and we had a stroll round Canterbury and lunch. I knew right away that we would be friends. At the wedding I got to meet his partner and the family too. They were all lovely. Alan and I went back to their house between the ceremony and the reception. The house is fab. Just the sort of place I like. Philip told me I would like it. I feel blessed to have these people in my life. Alan and I really enjoyed the wedding and I am looking forward to him getting here next week so we can mull over it again. Then back home. Philip was very stressed. The drive to and from work (he works in Chicago and has a 76 mile drive there and back) is getting him down. Things will have to change in 2011. My work dwindled to one day a week and now it is at about one day every two weeks. I cannot manage on this little money. That will have to change in 2011 too. We have been fortunate to have Donna and Lauren here for Christmas and New Year. Donna is out gallavanting tonight with her "cowboy". She has been out lots and lots. I am so pleased to see her enjoying herself as she doesn't get much chance to at home. Lauren is a joy. Such fun and no trouble at all. They go home on Sunday and I shall be very sad. They don't want to go...........sigh. Glenn is better now, so that is a blessing. Oh did I tell you he sent us a lovely Christmas card.....only it wasn't.......it said Happy Birthday inside? He didn't realise. Some things never change. But, he sent us Christmas gifts and they weren't wrapped in his dirty washing as some of my pressies have been before. So, goodbye 2010. You were a mixed bag. I hope 2011 is gentle with us all. Father Christmas crept in during the night. Or.....it might have been Donna creeping in from the pub. Anyway, it all started in a civilised fashion. A sea of wrapping paper, boxes and bows.........exactly what the living room should look like on Christmas morning. Father Christmas didn't forget anyone and despite our threats......he didn't leave anyone a lump of coal. Gary arrived in the afternoon. He brought meat & fruit etc........silly thing. We told him to just bring himself. We all then ate and drank way too much. The day finished with a kitty cuddle for Lauren and a night on the razzle for Donna. Gary & Philip watched Inception while I bimbled on the computer. It was lovely, it was tiring and it went by too fast. I am already getting sad because they will be going home soon. I feel as though they have been here forever and I will miss them muchly. I suppose I have been lucky this year with how much time we have spent together. I am hoping 2011 will be good for that too. Donna is talking about coming back pretty soon and maybe even spending August here with Lauren. I mustn't get too excited over that in case it doesn't pan out. Alanmas will soon be upon us and then we are hoping that Peter (Philip's adoptive father) and Chris may be able to visit in the summer. So, I am not going to allow any melancholy to spoil the next few days. They will be back. I aim to enjoy their company while they are here. These are the home made cookies the lady over the road brought over. Today I gave gifts to their two lovely little girls. They were not anything extravagant just a Christmas ornament each but it made me feel so much better that I had returned the compliment. I suspect we have now started a new tradition. But, I am glad. Christmas to me is wonderful. I will love buying a little something for their kids every year as I do for the kids down the road. ....the ones Lauren plays with. Lauren with one of Philip's soppy hats. This evening, as we were having our Christmas Eve dinner.....this is cheese, biscuits, super bread, olive oil, seasonings (for dipping) and meat for the carnivores......Donna informed me that we were going to be visited by 3 ghosts.........nope, sorry, I mean by the parents ( Mary & Marty) of Lauren's mates down the road. I had sent them down there earlier to deliver the (small) gifts that we always get for their kids. We had just finished noshing & drinking some rather spiffing wine that Philip's boss had given him, when there was a hammering on the door. They all came in bearing gifts. I did remonstrate with them ........to no avail........it seems that in previous years they have had very hard times. We have always bought their kids gifts and apparently they were really appreciative of this..........who knew? We didn't......well not really. We knew times were tough for everyone but I do love their kids......little buggers they are but they do make me laugh. Anyway, apparently they have done a little better this year and wanted to return the favour. They bought for Philip and I, for Donna and for Lauren. You know mates.........this Christmas mallarky comes in for a lot of stick, but all the time it can create such good feeling between people ........I know it can't be bad. During their visit there was yet another hammering on the door. A whole bunch of kids Carol singing. Oh I did love it. There were kids from next door (one of which is a little git who Philip would like to strangle and his two twin sisters) they sung beautifully. Well they did after I told them I would only listen if they all (the little git was not singing initially) sang a real carol...........none of this "we wish you a merry Christmas mallarky". They started again and sang a lovely Carol. We all then had a whip round and they finished up with about $12.........I think this is way better than being horrid to the kids.........they will now feel a bit more appreciative of us too. Anyways, I so enjoy a good Carol. When I lived in Kingsnorth...village in England.....we had lots of Carol singers and I was only thinking the other day how we didn't seem to get them here. They sung a proper Carol too...........you have to reward that. Today we also visited my friend June. She is so religious, so catholic, but you know, if everyone who purports to be Christian was like my mate June then there would be no more wars. She is everything a true Christian should be. Instead of just spouting off about what should be done she bloody well does it. She has picked people up in her car because it was cold and they were carrying shopping. This is madness really............but she can't bear the thought of someone walking home when she is driving. She is over 70 years old and is the kindest most caring person I have ever met. She presented us with a bag full of goodies that she said we must not look at until Christmas Day. When I said it seemed awfully heavy she replied that there was 4 of us so it would be. You really need to know June to realise how good and kind she is. Lauren has now gone to bed. She is waiting for the big day. I am totally worn out.........we have made mince pies & cheese biscuits & cheese straws today. Donna had a fab night out with the guy she has met this visit and is wondering if she will see him again before she goes home. This year has been a little different. I have had a couple of really bad Christmasses. To be honest........I doubt anyone has had any that were worse than those I have suffered. But, I am an optimist. I believe in people......I believe things can only get better. This year we have had some dodgy times. I almost lost my son..........with what has happened to me in the past this was exceptionally horrendous. But, he survived, I survived.........and most importantly, we have new family. To find you have new family and family that were so amazing and so friendly........is something that will not happen to most people. I am always appreciative of new friends. New family that are also new friends !!!!! how often does that happen. Peter & Chris.....you have amazed me. I love you both. I hope that one day you will visit us. You are truly a fabulous couple and wonderful people. This last trip I also met some other new friends. They will be my friends for a long time. Big Big Steve's partner particularly. You are a very kind, courageous and wonderful person. I am honoured to have met you. To you all I wish a heartfelt merry Christmas. New Years scare me as I have been caught out in the past ..........Happy New Year.....hmmmm...you never know what a new year holds so I don't do the whole happy new year thing. I wish you all a Healthy New Year. In the morning we had made the Christmas Yule Cake. Instead of a log I made a chocolate cake, with little mushrooms and decorations on it. I usually make a fruit cake but Donna and Lauren don't eat it. The little one at the top is a fruit cake I brought back from England for Philip. It is impossible to make just one fruit cake that small. I also have difficulty finding the fruit I want over here too. Last night we went to the Country Springs Hotel where they have amazing lights and animated figure displays all through the grounds. Pictures really don't do it credit because it is very beautiful. Apart from the lights they have all these little houses set up which have Christmassy scenes in them. Afterwards we had exceedingly sweet cappucino which had to be put in the bin as no one could drink the stuff. It was like hot syrup. Some of us were very tired after this busy day. Just now our new neighbour from across the road knocked on the door bearing a gift of home made cookies. They look amazing and I feel a bit embarrassed that I had nothing to give in return. Tonight we are off to see Christmas Carol at the theatre. After that Donna is out gallavanting......I heard Karaoke mentioned.......oh my. 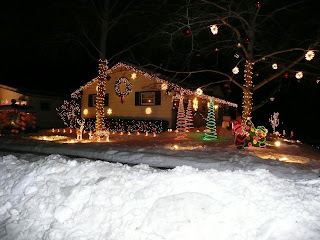 We went to Candy Cane Lane where they decorate all the houses and collect for charity. Our house would fit in just fine. Oh it is so fab having Donna & Lauren here for Christmas. The house is full of people and gets untidy in a way that it never does with just Philip and I.
I know I like things to be reasonably tidy but I love the way it all just gets messy when we have them to stay. Lauren is keeping the kitties amused. She is absolutely no trouble at all. A really sweet kid. Tomorrow we are going to Country Springs Hotel where they have an amazing lights show in the grounds that you drive through. It is something like 2 miles of moving lighted displays. When you get to the end there are a couple of buildings where there is a Christmas display of trains and animated figures. You can also get a wicked hot chocolate or coffee. The other building houses a wonderful life size nativity which is rather moving. This was Father Christmas at Mayfair Mall. He wasn't quite the 'real' Father Christmas that I saw a couple of weeks ago but he was pretty close. We are all having fun opening our advent calendars. I save them from year to year....don't like the choccy ones.....I like the proper picture ones from Germany........because I save them Lauren has about a dozen of them on the walls of her bedroom. Tomorrow Lauren and I will make the chocolate yule cake. It isn't going to be a log this year but will appear to be a slice from a large tree. Errmmmmmmmmm.........that is the theory anyway. I shall post a picture and we can see if we achieved the desired effect. Pah...it will still taste good even if it looks pants. We still have the mince pies to make too. They don't have such things as......Christmas cake......Christmas pud.......mince pies.......yule logs.......etc ...over here so if you want it you have to make it. Donna brought me a Christmas pud this year to save me making one and Philip wants me to make Christmas pudding ice cream which I have done in the past. It is somehow lighter and more refreshing than eating a heavy pud after an enormous dinner. Tonight Donna is out with the parents of Lauren's mates who live just up the road. They have gone to a Country & Western night at Mad Dog's Bar. I think Donna is hoping to hook a cowboy. Good luck to her. After a tense day wondering if the weather would cause their flight to be cancelled.......they arrived. They had a perfect flight with just a slight delay. It is wonderful to have them here. In fact, it feels that Lauren has never been away as she spent the whole summer with us. And, of course, I was over there for 6 weeks too. We are all very excited about Crimbo. Lauren & Donna were very impressed with all the decorations inside and outside the house. I thought I had everything covered.......living room, kitchen (even Christmas curtains in there), hallways, stairs, bedrooms (even Christmas bedding), bathroom (yep, Christmas decs, tree & Christmas toilet mat) dining room.......all suitable adorned and festooned with all that festively sparkles. How could I get it so wrong? The basement had been overlooked. But not for long. As I had done most of the other stuff myself, Philip & Lauren (with a little feline help along the way) undertook to decorate the basement. Tree, lights, lanterns, garlands, tinsel...........the whole shabbang. They spent the afternoon working on it. Both seemed to get a lot of fun out of it. The pictures don't really do it justice. Everything is covered or surrounded in tinsel. Oh Alan will be pleased. He arrives on January 5th. We take down the decorations on January 6th so he will be here to join in the fun. I think I can here him laughing from here. Donna has now gone to the pub to meet up with the mates she made when she was here in February. Lauren is in bed watching Shrek III. She is a bit tired but then her body clock is telling her it is 2.15am. Tomorrow we are out for brekkie, then to the mall in the hope of seeing the 'real' Father Christmas there. In the evening we are going to see all the fabulous lights and decorations on the houses in Candy Cane Lane. Donna is hoping it is firefighters night (they collect for a children's charity) and I wouldn't mind it either. "Mrs Turkey flapped one wing........."
This morning I spent 20 minutes dressing myself suitably for a trip to the mall. 4 layers of clothing, scarf, headsock and heavy duty, arctic tundra gloves, Captain Oates ( "I am just going outside and may be some time") boots.........should have meant I was reasonably comfortable. No gloves seem to be able to withstand the Wisconsin climate. I made yet another new friend at the bus stop despite all my efforts not to. He insisted on talking to me. About.........the bus - how come it hadn't come along yet and if we didn't ride it they wouldn't get paid, yet they would have to put gas in the tank anyway. About.........it wasn't cold (!!!!) just brisk and this sort of weather makes you feel 'alive'. I said I would just as soon prefer to feel warm and 'alive'. About.........how he used to ice skate. He used to be a fab ice skater....up to olympic standards. About.........how he used to swim in the ocean with sharks, jelly fish and stingrays. Those sharks won't touch you unless you are already bleeding. They leave you be. It is like, if I stood on your toes then you'd be justified on standing on my toes 'cause there aint nobody got the right to stand on anyone's else's toes. I said I hoped the sharks knew about this this. Apparently they do because the good lord told them. He told them they are not to bite anyone who hasn't bitten them first. Sigh.......where was the poxy bus? About........how he has read the bible 4 times right through. Old and New Testament and he is currently reading it again because that is the only way to understand it. The good lord heard my prayers because the bus came. I have coping techniques I never stray from. Never, ever get on the bus first or they can come and sit next to you. He waved me on....I refused and waved him on. I then sat way at the back. When we got off at the mall he walked alongside me and was telling me what nice coffee they sell in one of the shops there. He was just trying to get to the point of asking me to have coffee with him when I stopped, said goodbye and dived into the nearest store. Heh heh which happened to be a sports memorabilia shop. Like that would interest me. I kept a sharp lookout but didn't see him again. Then I could hear singing and went to have a nose. Oh bugger..........a class of 4 and 5 year olds, dressed in their best clothes, tinsel wrapped around their heads, were singing Christmas songs. I hadn't heard any of them before. All the songs had actions. The Mrs Turkey flapping one wing and stomping one foot....no the other foot......was hilarious. One little boy refused to take part at all and stood with folded arms staring straight in front of him. His distraught mother was jigging about trying to get him to sing and do the actions. He refused to acknowledge she was even there. Another little boy managed to sing, flap his wing, stomp and pick his nose at the same time. It was wonderful and quite made my week. Of course, as usual, I dissolved into tears just watching them. Pah......I had only put my make up on a little while ago. What a state I must have looked. I bet my shark baiting, ice skating, bible reading mate would have gone off me now. This is one of our squirrels. Oh he did look so very cold sitting on the fence just outside the kitchen window. I do feed them though. Poor lickle fings. Firstly, we had Operation Catstorm on Saturday morning. We were up early.......to give Lily her sedative. She bloody knew something was up. She slept on my head all night and then didn't want to come out of the bedroom in the morning....not even for brekkie. Philip held her while I popped the teenie tiny pill in her gob. She did the usual ...'ack, ack' ..thing but I didn't see the pill come out. But, she has long, fluffy fur. What if she spat it out and it was stuck in there? I spent some time checking her fur before letting her go. Then I spent some more time checking the floor where she walked in case she sneaked it out. All I needed was for her to spit it out and then one of the others eat it. Half an hour later it was obvious she had swallowed it. She was kinda wobbly. Her legs wouldn't work properly and her eyes were looking east and west. I phoned the vet to see if they had a space so we could come in sooner. "Sure" said one of the receptionists, "Bring them in now". "Erm, one of the cats I am bringing gets stressed and we need to go straight in with no hanging about", said I. The last thing I wanted was to go early and then have to wait for ages whilst our little, white , fluffy, ticking time bomb festered away in her box. "Oh yes", she said, "Lily. We have all been warned about her. We are ready for her". Poor Lily. She is so sweet & cute and they had all been warned about the monster, spawn of the devil from hell that was on its way. Happily all went well, no exploding cats and we were soon home. It took Lily about 10 hours to recover from her sedation though. I really didn't like to see her like that. I had to carry her up and down stairs. But, it was preferable to seeing her totally freak out. That can't do her any good. Certainly doesn't do me much good. Then we had a winter storm warning so we decided to stay in the rest of the day. Sunday morning we woke to howling winds and sideways snow. It is bitterly cold. I don't even know what the windchill is but we stayed in again. I don't like staying in. I get cabin fever bloody quick. But, it is no fun going out there right now. So, I cooked Philip a full English brekkie. Oh he did like that, even without proper English sausages. They can't make sausages properly here. It isn't something I can bring back with me either. I spent the afternoon wrapping more gifts. I am almost done now....I think. Tomorrow doesn't look to be any better so I will be indoors again, but Philip is going to take me to Pat's after dinner to catch up with some of her paperwork. I have also got Lauren's bedroom ready for her. They should arrive on Friday. We are so looking forward to it. Lauren can help me make mince pies and a yule log. That is if she isn't up the road playing with their kitten. I tried to get the kitties Christmas photo today. All four were on the sofa together. Brill.......off I went to get a bit of tinsel to make it look festive. Sigh..............there is a saying about trying to herd cats. As soon as I put the tinsel down Looby Loo took exception to it (any other time she won't leave the stuff alone) so she took off. Never mind ......I will get three of them to look at me and I will take the picture......I thought. This first effort Lollipop isn't looking, Lily is poking her tongue out and Bubba looks like he is singing Carols. The second one was a bit better. They still don't look impressed though. She hasn't wanted me for the last two weeks but wanted me to come in tomorrow. I have just heard the weather forecast. I don't mind the snow. I have snow boots and I even have chains to put on them to cope with the ice. I am not easily put off. But, the temperature tomorrow is forecast to be minus 25 C with windchill. I am not waiting for buses and then walking for 20 minutes in that. I went to the mall today and it was about minus 10C. But, to get there I don't have to walk too far to the bus and then it drops me off right outside the mall. I still got very cold though. Yesterday I finished decorating the tree. Oh it looks lovely.......but then I think all Christmas Trees are lovely. This afternoon I started wrapping pressies. I have a lot to wrap as Donna and Lauren are going to be here too. Still, if I am not working tomorrow I can wrap a few more then. I have to get them done before they arrive. Still no decorations across the road. I saw Mary, who lives down the road a little (she is the mother of Lauren's mates) and I asked her about it. She said some people have a tradition of putting up their tree etc on Christmas Eve. I hope this is the case, although it seems a waste of time to put it up just for a few days. Mary also told me that they have just got a 9 week old kitten. Oh well..........we won't see much of Lauren this visit then. We got the tree yesterday. Oh it is beautiful. Perfect size, perfect shape. It also seems very fresh and smells divine. I hope it keeps well. We cut a few inches off the end and then put it in the stand filled with tree preserver. This usually keeps them fresh. We left it overnight to relax and then this afternoon we put the lights on it. Well, before we put the lights on it we found a bird's nest in it. Minus bird I hasten to add ..........with 4 cats that wouldn't have been funny. I bet he was cross when he came home to find his tree was gone. Philip got stuck in with the lights. He is good at this job. Well I can't reach to top of the tree anyways, being a short arse. We have replaced all the crappy LEDs with proper lights this year. Actually, Philip wants to put our artificial tree down in the basement. He wants to decorate it with Lauren when she is here. So, the LEDs are going on that one. I am going to start putting the decorations on this one tomorrow. I will take a photo of it when it is done. This does seem, so far, to be one of our best trees. Looby Loo is thrilled. Her tree is back. She will soon be able to hide under it, tucked in the corner. Friday I went out Christmas shopping and then to dinner with a mate of mine, her son, his lady friend and the ladyfriend's daughter. This son is recently divorced and the rest of my friend's kids (she has 6) will have nothing to do with this new lady. They claim it is from loyalty to his former wife but my friend suspects ( and I think she is probably right) that it is because she is black. She was so keen for me to go with them just to prove that not everyone has a problem with it. The new ladyfriend is lovely. Her daughter is a smashing kid, the same age as Lauren. She chatted to me the whole time........about her school, her friends, my accent, London, do the guards at the palace smile...........I found a new friend. I even offered baby sitting services. My friend's family are the ones who will be missing out by not including these people. I really don't understand colour prejudice. I like anyone who is a kind, friendly, honest person. I really don't like anyone who is cruel, spiteful or tells lies..........whatever bloody colour they are. I am worried about the kids across the road. This family moved in a few months ago and they have two lovely little girls. Everyone here now has their houses done and trees up. We don't leave it late because of the snow, ice and poxy sub zero temperatures. I keep telling myself that maybe they are just a bit late with them, but I saw the little girls standing outside gazing at our display and it worried me. There isn't even a twinkling light from inside their house. I wondered if they are Jewish......but I have spoken with them quite a few times and I know Jewish people......they just don't seem Jewish. Plus, it is Hannukah at the moment and there is no sign of a menorah over there. I am really hoping they are not Jehovah's Witnesses. I have known a few of them too but never any with kids. I can't stand the thought of those kids seeing all the beautiful Christmas displays and not having anything themselves. Now that seems cruel to me. The Jehovahs are a queer bunch. The next time I see the mum outside I have made up my mind to ask. I shall say "Do you celebrate Christmas?" and see what she says. I will admit America has its share of oddball religions. Yesterday was a dodgy day for me. I won't go into details because it is still something I find it hard to talk about with even my closest friends and family. Every year on that day I find myself looking back and reliving an old, painful memory that remains so vivid. A doctor told me at the time that I would never get over it but that I would come to terms with it. I don't know that I have.........all these years later. I have had no work now for two weeks. That isn't fun coming up to Christmas, especially when you have family coming to stay. But, she wants me to come in next week so that is something. Today I went to the dentist for cleaning. Actually though it didn't seem quite so bad this time. I did notice the hygienist said something about a sonic descaler or something. I was a bit surprised because I thought she said 'sonic screwdriver' and I wondered what Dr Who had to do with my teeth. I am thinking now that the sonic oojamaflip must have got rid of a lot of the stuff she usually spends an age hacking and scraping at, because she did no where near as much of that torture. One awful moment though. I always have a fluoride treatment. She asked me if I wanted it to which I replied " Yes. I think it is good and it tastes yummy too"
She then said, "Oh we have cherry flavour this time". Oh I can't stand cherry flavour (cherries are evil) and I told her so in no uncertain terms. She then had to scout around the other hygienists until she found a melon flavoured treatment for me. We then had a giggle about what might have happened if I hadn't mentioned it. She said she would have just plastered it around my gob and I said I would have then probably up chucked all over the place. I think I have almost finished decorating the house for Crimbo. We will buy the tree at the weekend so I shall work on that next week. There is quite a lot of talk about the royal wedding over here. What does make me smile is the number of times I am asked if I am going. I just smile and reply that my invitation hasn't arrived yet but this could be due to the snow in the UK. Tonight I think I may have a drinkie poo or three. As the old saying goes..........."To hell with poverty, throw another pea in the pot".